Many Americans pride themselves in having the mostest, the biggest, the freest, the baddest and most diverse media system in the world. Thousands of radio and TV channels to choose from. A glut of newspapers and magazines of all kinds. And, of course there’s the Internet, with its huge number of corporate and institutionally-sponsored information websites of all kinds. Surely in those numbers lies the guarantee of free, accurate and diverse coverage of news and opinion. Surely all points of view are reflected and included in that enormous “marketplace of ideas”???! Right?? Well, no. And if you think that way, I advise you disinvest yourself of that notion as soon as possible. It’s a fools’ trap. The whole darn thing is a delusion. Below I explain how this machinery of deliberate disinformation operates. Let me begin by providing a short video that will probably both astonish and shock you for the infuriating truth it reveals about “our” media: basically, that diversity of content is an illusion, a deliberate deception, the more so when it comes to ANYTHING of even transient importance to the plutocratic 0.00001% controlling just about everything of some property value in the US and across the globe. Yes. Media diversity is a mirage. It does not exist in America. And it does not exist in much of the US-influenced world, which mirrors, often without proper understanding, the “American way” of doing things. Here’s a brilliant explanation by one of the most lucid media critics and analysts in the Western world, my former colleague, the late Herbert Schiller, author of a must read book, The Mind Managers. Personal choice exercised in an environment of cultural-informational diversity is the image, circulated worldwide, of the condition of life in America. This view is also internalized in the belief structure of a large majority of Americans, which makes them particularly susceptible to thoroughgoing manipulation. It is, therefore, one of the central myths upon which management flourishes. Choice and diversity, though separate concepts, are in fact inseparable; choice is unattainable in any real sense without diversity. If real options are nonexistent, choosing is either meaningless or manipulative. It is manipulative when accompanied by the illusion that the choice is meaningful. Though it cannot be verified, the odds are that the illusion of informational choice is more pervasive in the United States than anywhere else in the world. The illusion is sustained by a willingness, deliberately maintained by information controllers, to mistake abundance of media for diversity of content. It is easy to believe that a nation that has more than 6.700 commercial radio stations , in excess of 700 commercial TV stations, 1,500 daily newspapers, hundreds of periodicals, a film industry that produces a couple of hundred new features a year, and a billion-dollar private book-publishing industry provides a rich variety of information and entertainment to its people. The fact of the matter is that, except for a rather small and highly selective segment of the population who know what they are looking for and can therefore take advantage of the massive communications flow, most Americans are basically, though unconsciously, trapped in what amounts to a no-choice informational bind. True variety of opinion, as opposed to superficial differences, on foreign and domestic news or, for that matter, local community business, hardly exists in the media. This results essentially from the inherent identity of interests, material and, ideological, of property-holders (in this case, the private owners of the communications media), and from the monopolistic character of the communications industry in general. While there is a competition of sorts for audiences among the three major TV networks, two conditions determine the limits of the variety presented. Though each network struggles gamely to attract as large an audience as possible, it imitates its two rivals in program format and content. If ABC is successful with a western serial, CBS and NBC will in all likelihood “compete” with their own “shoot-’em-ups” in the same time slot. Besides, each of the three national networks is part of, or is itself, an enormous communications business, with the drives and motivations of any other profit-seeking enterprise. This means that diversity in the informational-entertainment sector exists only in the sense that there are a number of superficially different versions of the main categories of program. For example, there are several talk shows on late-night TV; there may be half a dozen private-eye, western, or law- and-order TV serials to “choose from” in prime time; there are three network news commentators with different personalities who offer essentially identical information. 1 One can switch the radio dial and get round-the-clock news from one or, at most, two news services; or one can hear Top 40 popular songs played by. “competing” disc jockeys. Though no single program, performer, commentator, or informational bit is necessarily identical to its competitors, there is no significant qualitative difference. [On the other hand, the size of the audience regularly reached by progressive media is so miniscule as to be politically impotent to expand, in a meaningful way, the boundaries of the national debate.] Just as a supermarket offers six identical soaps in different colors and a drugstore sells a variety of brands of aspirin at different prices, disc jockeys play the same records, between personalized advertisements for different commodities. The media mix varies in abundance from city to city, and from urban to rural communities. The major metropolitan centers may have half a dozen TV channels, thirty or forty radio stations, two or three newspapers, and dozens of movie houses. Less urbanized communities will ordinarily have far fewer informational-entertainment facilities. The greater the number of communications sources, obviously, the larger the number of informational messages and stimuli. But whether richly or poorly supplied, the result is basically the same. 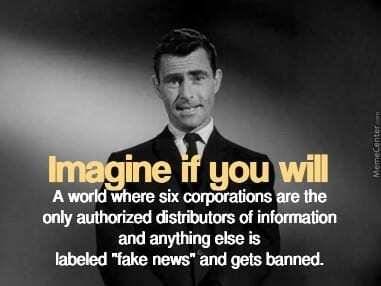 The entertainment, the news, the information, and the messages are selected fromthe same informational universe by “gatekeepers” motivated by essentially inescapable commercial imperatives. Style and metaphor may vary, but not the essence. Yet it is this condition of communicational pluralism, empty as it is of real diversity, which affords great strength to the prevailing system of consciousness packaging., The multichannel communications flow creates confidence in, and lends credibility to, the notion of free informational choice. Meanwhile, its main effect is to provide continuous reinforcement of the status quo. Similar stimuli, emanating fromapparently diverse sources, envelop the listener/viewer/reader in a message/image environment that ordinarily seems uncontrolled, relatively free, and quite natural. How could it be otherwise with such an abundance of programs and transmitters? Corporate profit-seeking, the main objective of conglomerized communications, however real and ultimately determining, is an invisible abstraction to the consumers of the cultural images. And one thing is certain: the media do not call their audiences’ attention to its existence or its mode of operation. The lore of capitalism has given rise to many self-serving myths, and nowhere have they found a more hospitable soil than in the United States. The fundamental similarity of the informational material and cultural messages that each of the mass media independently transmits makes it necessary to view the communications systern as a totality. The media are mutually and continuously reinforcing. Since they operate according to commercial rules, rely on advertising, and are tied tightly to the corporate economy and its worldview, both in their own structure and in their relationships with sponsors, the media constitute an industry, not an aggregation of independent, freewheeling informational entrepreneurs, each offering a highly individualistic product. By need and by design, therefore, the images and messages they purvey, are, with few exceptions, constructed to achieve similar objectives, which are, simply put, profitability and the affirmation and maintenance of the private ownership consumerist society. Consequently, research directed at discovering the impact of a single TV program or movie, or even an entire category of stimuli, such as “violence on TV,” c an often be fruitless. Who can justifiably claim that TV violence is inducing delinquent juvenile behavior when violence is endemic to all mass communications channels? Who can suggest that any single category of programming is producing male chauvinist or racist behavior when stimuli and imagery carrying such sentiments flow unceasingly through all the channels of transmission? It is generally agreed that television is the most powerful medium; certainly its influence as a purveyor of the system’s values cannot be overstated. All the same, television, no matter how powerful, itself depends on the absence of dissonant stimuli in other media. Each of the informational channels makes its unique contribution, but the result is the same–the consolidation of the status quo. What the writer is telling us, obliquely, is that most Americans have a reliable “frame of reference,” organized “consciously and unconsciously” by communications sources such as TV Guide, among hundreds of others. So fortified, the average American will accept information which affirms the consumer society and reject material which views it critically. When an American has been properly “prepared,” he or she is relatively invulnerable to critical messages, however accurate they may be. No doubt the “frame of reference” would be less effective, if communications were in fact pluralistic, as they claim to be, and their messages actually diverse. But with multimedia reinforcement achieved through numerous but only superficially differing informational means, most people’s consciousness is neatly packaged from infancy . Two techniques that facilitate this process are fragmentation and immediacy of information. Every single day, from cradle to grave, the American population is subjected to a nonstop barrage of lies, omissions of truths and outrageous distortions, with the sole purpose of maintaining the nation’s allegiance to the imperialist/capitalist status quo anchored in constant war and unstoppable inequality. The American system of disinformation, evolved over more than a century, fools just about everyone with its apparent diversity of sources. After all the US has literally thousands of “news” outlets, from radio stations to tv stations, newspapers and other channels, and people reckon that this enormous quantity of media must automatically guarantee a vigorous debate of the issues at hand and the presentation of all viewpoints. They could not be more wrong. This diversity is an illusion. 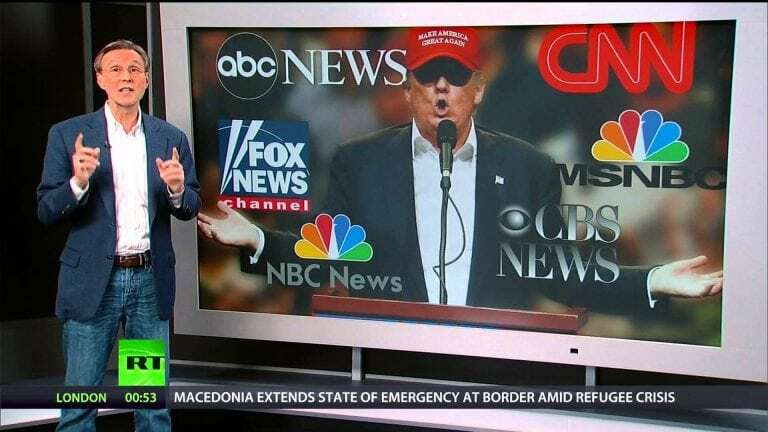 What the American media offer is not a well-informed diversity of views by a long shot, but brute quantity, “numerosity”, groupthink, and a tedious and dangerous repetition of the same official viewpoint, always designed to bolster the status quo. To aggravate matters, the American media are well known for their tendency to travel in packs, the trademark of groupthink, and, at any moment to carpet bomb the American mind with any propaganda line, no matter how silly, outrageous and lacking in evidence, ordered by their wealthy owners or hidden intelligence and military agency controllers. The current unrelenting Russiagate campaign and hysterical demonisation of any enemy of Washington’s global supremacist project, is a case in point. It is but the latest of numerous efforts to control the national and global narrative regardless of costs to the general population at home or billions of people outside America’s frontiers. The above sounds like a complete rejection of what the mainstream media would like us to think about their role and performance, but our brief is irrefutable. What matters most in the marketplace of ideas (which is really the marketplace of political ideologies), is that in a deeply class-divided society such as the United States, with uber billionaires on one side and ordinary citizens and paupers on the other, each class viewpoint should at least be fairly represented. (I realise this is in itself a contradiction between civics 101 and reality: if good democratic representation existed, such inequality and grotesque abuses would not likely exist). In the US—as it so clearly also happens with the political system promising but not delivering voter influence on policy decisions—the media deliberately fail their proper role. In that sense we see an inevitable parallelism: both the political system and the media fail because neither is really interested in serving the people. Why do people in this supposedly free society tolerate such an obviously flawed state of affairs? Ironically, when we examine this problem at a deeper level, part of the the illusion of free media and diversity is supported in the US by reference to what the US is supposedly not: a totalitarian system. A century-old anticommunist campaign depicting Russia, China and other non-capitalist societies as the summation of everything evil and undesirable includes the idea that it is state control of the media that defines a non-democratic society. Yet, as history shows, this is not only superficial but false. State control of media is not, per se, sufficient to determine the degree of “democracy” existing in a polity, if by “democracy” we mean, inter alia, equality before the law, diffusion of power, and non-autocratic rule. The “good society” —if we are to follow the multiparty capitalist democracy model—is rarely achieved through this arrangement, and often quite the opposite, as the case of America, the most vociferous nation proclaiming its excellence in democracy, abundantly shows. A nation riddled with grave social injustice, pervasive economic insecurity, grotesque inequality, and a cancerous and criminal militarism cannot issue from a healthy political system, no matter what anyone chooses to call it. Actually, shocking as the study may be to those for whom US exceptionalism is an unquestionable dogma, Gilens and Page are too coy in their diagnosis, and too narrow on the data platform they chose to draw their conclusions. The US lack of authentic and vigorous democracy extends way back, almost to its inception (and many would argue, with plenty of reason, to its very foundation, as the new nation was designed as an aristocratic republic in the style of old Athens or Rome, and not an effective, inclusive democracy). Probably in an effort to avoid too much career-injuring controversy, Gilens and Page also refused to name capitalism as the inevitable source of such democratic evisceration. But labels, while helpful, can also obfuscate. At the end of the day, the main thing to decide whether or not we live in a good society is the policies themselves. The old cui bono DNA of any government. Who do these laws benefit? Who makes these laws? Who implements them? What mechanism exists to reshape laws when necessary? Returning to our initial question, are all single-party countries where the media are state-controlled “undemocratic” by definition, the answer is no. By their fruits you shalt know them. As Cuba, China and other nations have proved, the question reflects a capitalist way of looking at things, not a democratic view, per se. For in a true democracy we can easily envision all banks as public or cooperative institutions, if the popular will so desires. And the same can happen to the media. The notion that government automatically pollutes the media and that private control insures its virtue is false. For to properly answer that question we must ask another: how much of the well-informed, popular will is invested in that government? And yet another: how democratic do you think the average corporation or run-of-the-mill billionaire is? Chomsky said that corporations are hierarchic tyrannies, and we’re cool with that. It’s a practical and economical definition, even if this sector of society has spent and continues to spend tons of money on advertising and p.r. to convince people that it is the consumer who ultimately has all the power. Thus the perception that the US is a democracy and that its media is “free” and “vigorous” and “diverse” because they are privately owned, hence not “state” or “government-controlled”, the telltale sign of dreaded totalitarianism, is a serious misperception. For in a system of deeply integrated corporate fascism with a “friendly consumerist” face, as the US has developed, the distinction between the corporate line and the state line is virtually non-existent. The Greanville Post publishes a large number of articles dedicated to highlighting the manner in which reality is distorted for the sake of corporate and imperialist advantage (imperialism, for simplicity’s sake, merely being the global corporate system’s foreign policy). A whole section of this site—Media Front—is dedicated to archiving media—related essays. Day after day, media distortions have enormous and painful repercussions, at the personal and social level, and also at the vital ecological level, always blocking urgent remedial action while facilitating further assault in the form of increasing exploitation of human labour and nature, and the waging of endless and ever more dangerous genocidal wars. The Big Lie, energised in our time by a sophisticated apparatus of global communications in which false flags are routinely reported as truth, serves as both shield and legitimator for a criminally dysfunctional system in which decent and rational policy is all but eliminated. Here American media rooms generally need not be ‘infiltrated’, not that this hasn’t been relentlessly done (then buried). Yet the effect of decades of fake news promoting American exceptionalism and excessively demonizing all non-capitalists has produced several generations of robotic groupthinkers that have internalized the values of power. Rarely must such journalists even be instructed what to say; they already know what to say; they already know how to balance a story, how to under-report, how to deprioritize, how to frame, how to produce dead ends, how to terminate a train of thought, and how to remove responsibility from active agents using the passive tense. The techniques are myriad. Modern newsrooms are full of such obsequious zombies. (see J. Hirthler, Condemned to Repeat It: History as Rerun,). The above is not as hyperbolic as it sounds. WOULD YOU LIKE TO SEE THE WORLD AS IT REALLY IS? Stop living in Plato’s Cave and become media literate! Understanding how the media operate is vital to your mental health and liberation and that of others you care for. See world reality as it is and not as your current masters want you to see it. Acquire the simple tools by which you can spot and neutralise lies and disinformation, and eventually classify media according to their quality and moral integrity. Just a handful of articles can clean up a lot of the cobwebs you carry in your mind. Take the first step and check the following articles out. If you feel you learned something of value—which we bet you will—do not fail to pass them along to kin, friends and workmates. Breaking the stifling imperial machine of permanent lies depends on you. Patrice Greanville, who founded and published the first independent radical media review in the US, Cyrano’s Journal, is this publication’s editor in chief. “There’s no left in the US today.” Political persecution, media banishment and infiltration crippled it many decades ago. The poor, and all consciousness of our economic deterioration/poverty crisis were phased out of US media since the 1990s.